Yerevan, Armenia travel highlights. Includes monuments, cafes, ancient manuscripts, lively weekend markets, and Armenian people. Read about our visit to Yerevan and the rest of Armenia. Almost like a ghost, the snowy tip of Mt. Ararat hovers over Yerevan, Armenia's capital city. Considered to be the place where Noah's Ark landed after the flood, Mt. Ararat is a holy place for Armenians. Due to 20th century political and land games, Mt. Ararat is now located on Turkish soil, meaning it is off limits for Armenians. The peak appears on clear days, a constant reminder to the Armenians of what they felt was once theirs. Read about our visit to Yerevan and Armenia. 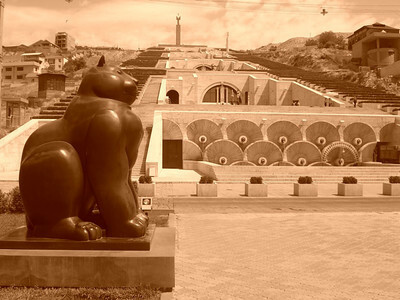 This fat black cat was one of our favorite sites in Yerevan. Supposedly a gift from a wealthy member of the Armenian diaspora, it sits proudly (and rather robustly) in front of The Cascade in downtown Yerevan. Read about our visit to Yerevan and Armenia. 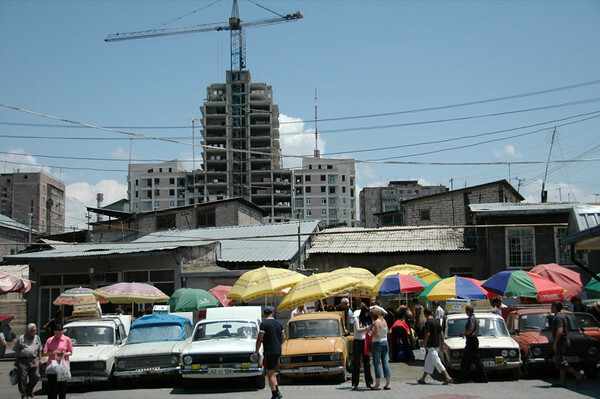 Much of downtown Yerevan has been demolished and rebuilt in a decidedly more modern style. 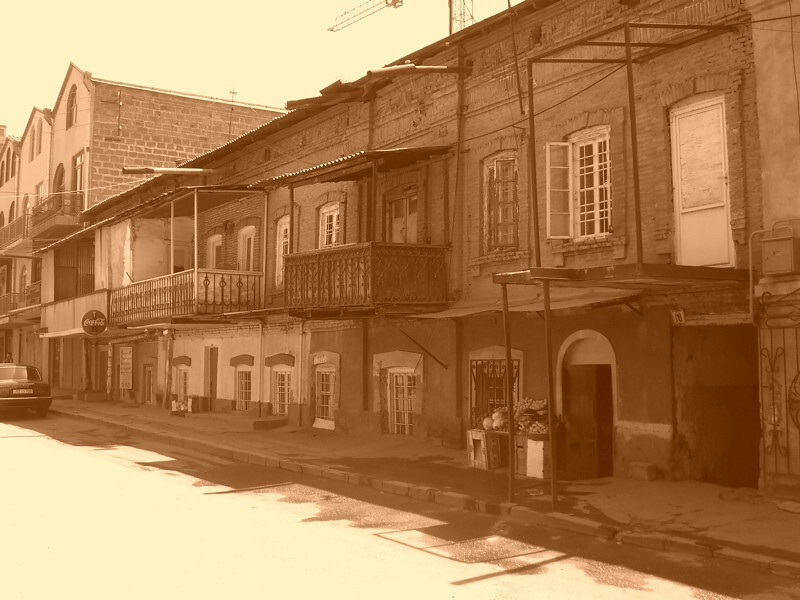 We caught a glimpse of what Yerevan's streets must have looked like before the recent construction boom. Read about our visit to Yerevan and Armenia. 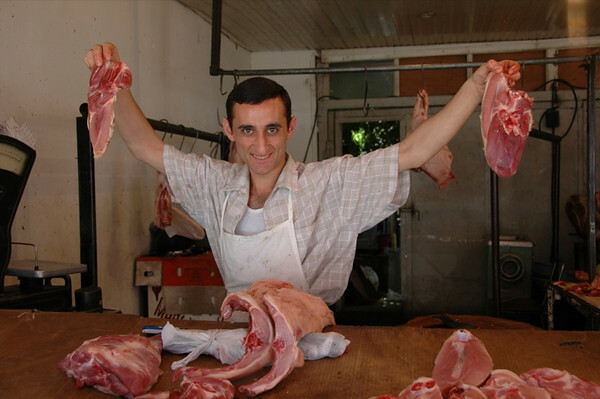 A meat guy hams it up outside the Gum market in Yerevan. 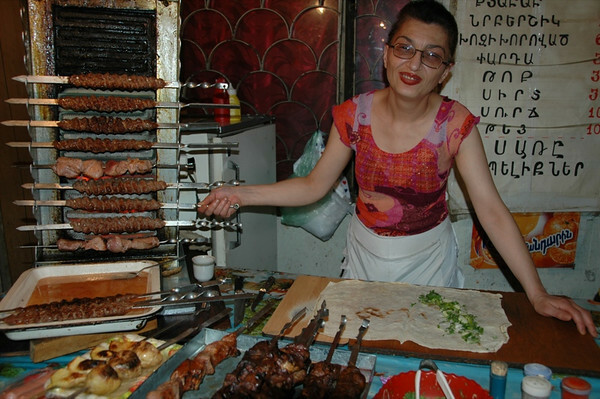 Read about Armenian food and the rest of our visit to Armenia. 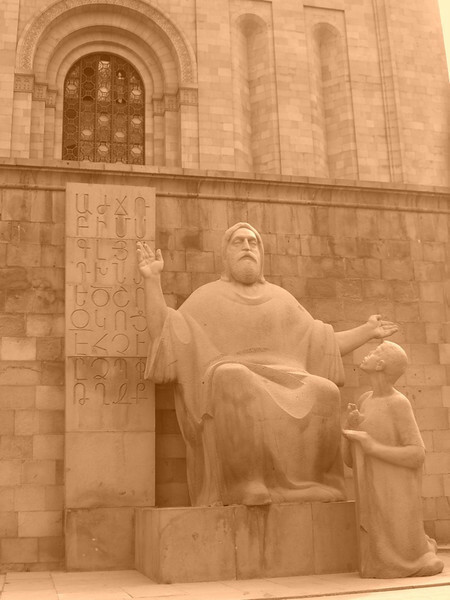 A statue outside the Matenadaran (museum of ancient scripts) in Yerevan depicts the great scholar Mashtots, who invented the Armenian alphabet in 4th century, sharing his knowledge with a scribe. The museum has manuscripts dating back to the 6th century. It's a beautiful and amazing collection. It's worth the extra money for a guide. Read about our visit to Yerevan and Armenia. 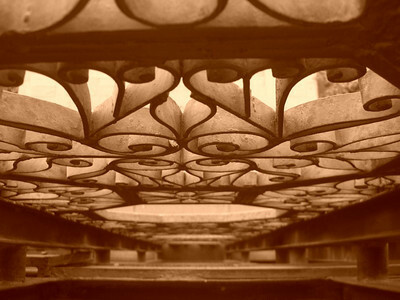 Decorative iron works adorn the windows at the Matenadaran museum in Yerevan. Read about our visit to Yerevan and Armenia. Audrey was blown away to find a Victoria's Secret in Yerevan. They didn't exist in Prague, nor most of Europe. Yerevan was like that - we would find specialty shops and items we hadn't seen since our last visit to the U.S. Who knew that Yerevan harbored such a demand for lingerie? Read about our visit to Yerevan and Armenia. 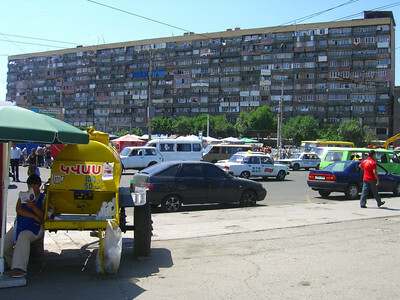 Kvas (sweet drink made from wheat) for sale in front of an apartment bloc relic from the Soviet period. Read about our visit to Yerevan and Armenia. 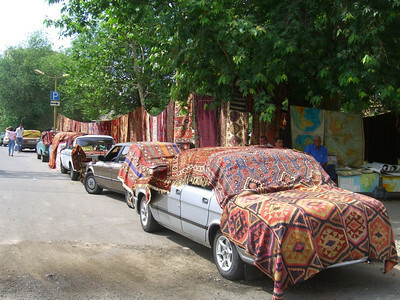 Colorful Armenian carpets keep cars cool at Yerevan's weekend Vernissage market. Souvenirs, crafts and carpets are on sale here for tourists while locals shop for everything imaginable at the flea market. 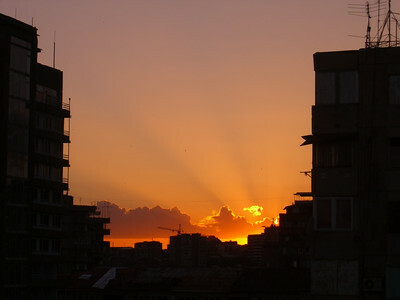 Read about our visit to Yerevan and Armenia. 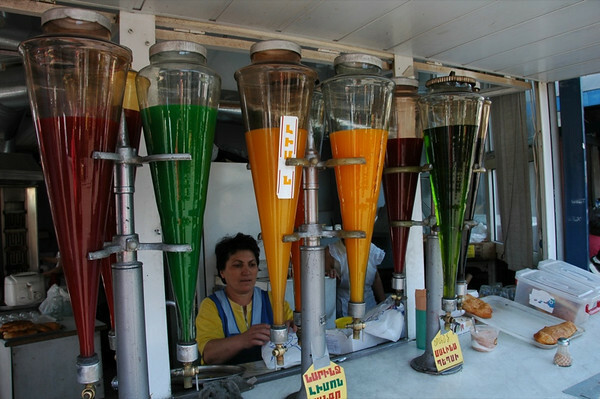 Large tanks of kvas (a sweet drink made from the fermentation of bread) line the market streets of Yerevan. 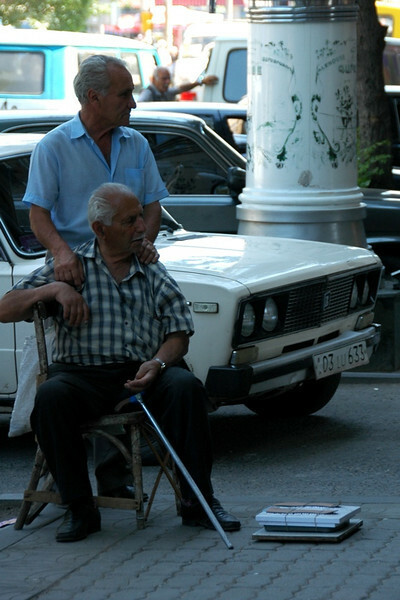 Read about our visit to Yerevan and Armenia. 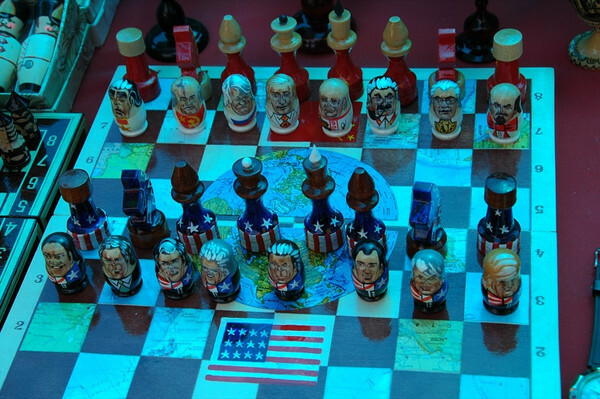 A chess board at Yerevan's Vernissage foreshadows things to come? Read about our visit to Yerevan and Armenia. Are people really so curious about their weight? 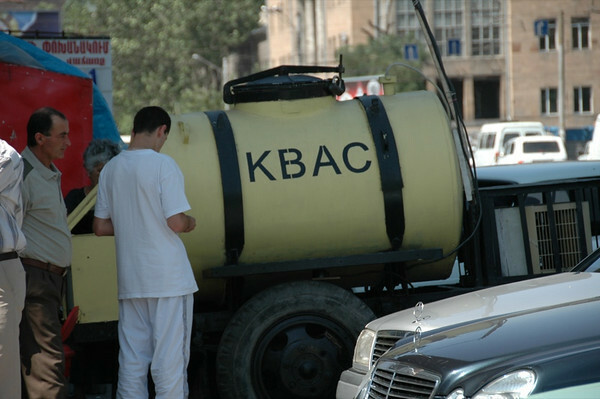 It's a common site to see people selling "weighing services" on the streets in Eastern Europe and the Caucasus. ..This is a simple scale, but sometimes there are elaborate talking electronic scales that give height, weight, and much more. Read about our visit to Yerevan and Armenia. This man had a random collection of goods for sale at Yerevan's weekend Vernissage market. He tried selling us a large hot water thermos after posing for this photo. He couldn't understand how we could resist. Read about our visit to Yerevan and Armenia. 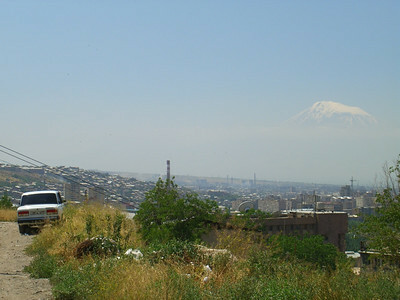 Notice the crane in the distance - Yerevan is a city under construction. New buildings are going up everywhere. Read about our visit to Yerevan and Armenia. 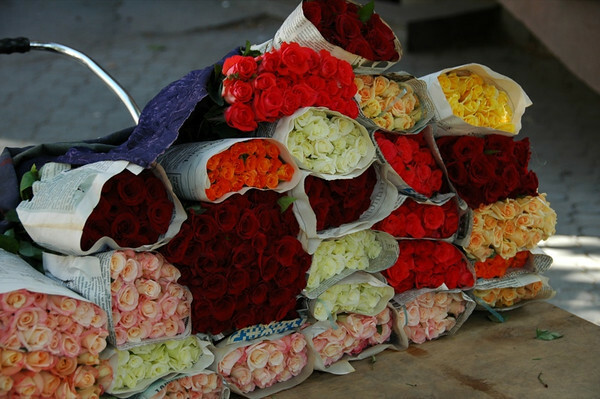 Bunches of roses for sale on the streets of Yerevan. Read about our visit to Yerevan and Armenia. 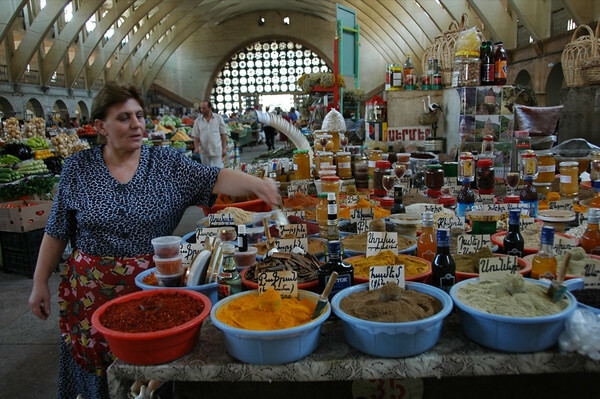 Yerevan hosts an outdoor arts, crafts and flea market each weekend called the Vernissage. 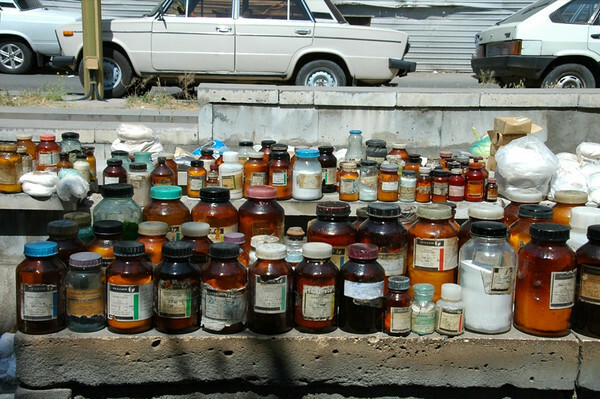 Everything and anything is for sale, including this collection of chemicals sitting in the sun. We wonder if a disgruntled scientist cleared out the lab to earn a little extra money. Read about our visit to Yerevan and Armenia.